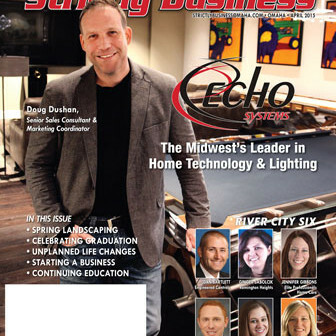 Echo Systems is the residential and commercial automation and lighting division of Echo Group, Inc, which has roots in the community dating back more than 60 years. 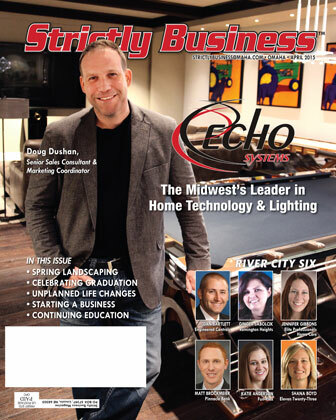 Echo Systems has quietly emerged as the Midwest’s fastest growing provider of professional electronic systems for homes, schools, offices hospitals, hotels and houses of worship. Echo’s showroom also boasts the area’s largest selection of designer lighting fixtures. Doug Dushan, Senior Sales Consultant & Marketing Coordinator featured on the cover, has over 16 years of experience translating clients’ needs into sophisticated yet easy to use technology solutions. He also serves as a Registered Outreach Instructor, certified by CEDIA, to provide continuing education credits to industry partners on a range of specialized subjects. Echo Systems is a proud member of the Greater Omaha Remodelers Association-NARI as well as the Custom Electronic Design & Installation Association-CEDIA, the Metro Omaha Builders Association-MOBA, an associate member of the American Institute of Architects-AIA and American Society of Interior Designers-ASID. Echo Systems is a result of a merger between the Echo Lighting and Echo Tech divisions, both located at 4315 S. 120th St. To demonstrate the impetus for the merger, Echo recently unveiled their new 12,000 sq. ft. $2 million dollar “Experience Center” at that same address. It is unlike anything in the central United States, perhaps in the nation. Anyone who is building, remodeling or even just curious about lighting or technology trends owes it to themselves to schedule a tour of this one of a kind facility. Visitors can stroll through this indoor “Street of Dreams” caliber home and take in the incredible design, while trying to identify the locations of the hidden technology, lighting control and motorized shades throughout this full sized residence. And just when you think it can’t get any nicer, the tour directs you to the Man Cave. This room is beyond cool. Mirror TV behind the bar, a cutting edge curved TV with Video Tiling that allows you to view multiple sporting events at once, incredible sound and simple control from an iPad in the wall. Through a set of dramatic double doors in a nearly million dollar home theater. Words don’t do any of this justice. Dushan would be quick to point out that even though the showroom features many high-end amenities and options, it is meant to simply be a tool for the imagination. At the end of the day it’s all custom for Echo Systems. They work with each client individually to help establish a realistic budget and expectation. They will educate you to the level of your interest and will back it up with exceptional customer service and competent execution. Of greatest importance is the building of a relationship between Echo’s staff and its clientele. Best you go see it for yourself! Schedule a showroom tour today!